A compact interface that nevertheless, manages to have many bases covered. Masses of I/O for a compact box. Onboard DSP particularly useful for live use. Hybrid connectivity - choose a free port! Not the cheapest interface out there. A compact box, but with plenty of tricks under the hood. A real one-stop solution for recording and live performance. MOTU have a proud history when it comes to building audio interfaces. Having developed the first FireWire 400 interface in the form of the no-nonsense '828', they've gone from strength-to-strength, fusing extensive I/O options, instant connectivity, high quality pre-amps and other assorted goodies. The latest is Mark 3 of the UltraLite range which marks a new development with both FireWire 400 and USB 2.0 ports. The UltraLite Mk3 is a compact, half-U module that manages to pack generous amounts of I/O into its slender frame. The front panel features a single XLR/Instrument input, while the back panel provides a second of these, alongside an additional six channels of line inputs. There are eight separate line outputs in addition to a main stereo pair, while digital connectivity is provided via S/PDIF I/O. MIDI In and Out ports are also present and, beneath these ports, both FireWire 400 and USB 2.0 ports so that you can connect up however you like. Each mic input features its own phantom power supply, pad and trim controls and as the unit is bus-powered, plugging in, setting levels and hitting record is the work of just a few minutes. However, description of the physical ports doesn't really do the UltraLite Mk3 justice, as this is a device designed to make studio or live mixing as simple as possible by carrying out a number of tasks internally. 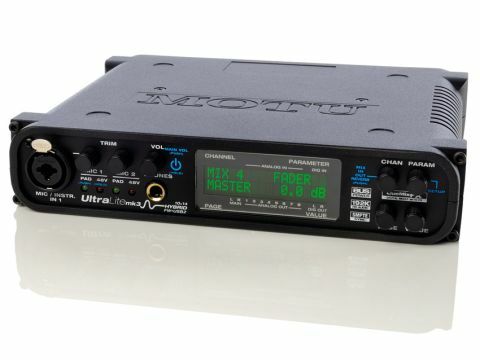 For starters, the UltraLite features the onboard CueMix FX digital mixer that includes reverb, EQ and compression effects that can be applied, per channel, without you having to boot your computer. These effects are impressive - the Classic Reverb algorithm offers five room types with frequency shelf options and reverb times of up to 60 seconds, while the dual compression options include a faithful model of the classic LA-2A compressor. A seven-band parametric EQ is provided for tone colouring, with four filter styles and classic 'British' EQ modelling technology. You can configure each channel in turn via the front-panel display, or if you prefer a more graphical approach, you can handle all of these tasks on your computer over FireWire or USB and then send them back to the UltraLite where up to seven such setup 'scenes' can be stored. As should be becoming clear, this means that UltraLite Mk3's boast about being 'hybrid' doesn't extend only to its dual-connection ports but also to its suitability as both a studio and onstage device. The ability to take this box out to act as your live mixer might seem brave, yet it's more than capable of fulfilling these criteria due to its flexible I/O and onboard effects. The UltraLite Mk3 manages to pack a staggering amount into a modestly-sized box and should appeal to those looking for a one-stop solution for both recorded and live work. The mic pres are clean and smooth, setup is straightforward and while configuring the unit extensively from the front panel alone requires a little more time, the option to handle such tasks from a computer provides further flexibility. There are cheaper interfaces available but none match the I/O, onboard processing and hybrid approach. In short, the UltraLite Mk3 won't let you down.